Size: approximately 11" x 20"
Cheers: Innovative design, easy to install, creates no slipstream drag, very lightweight, works as advertised. In the course of upgrading the panel of N399SB so I can regain IFR currency, it was necessary to install a VOR antenna. I really don't like hanging stuff out in the breeze if avoidable, and the traditional VOR cat-whisker is well, ugly, to boot. So the search began for alternatives by looking through the voluminous archives of the RV-List. The name that kept popping up in numerous posts was "Bob Archer". It seems that Mr. Archer designed some antennas for an aborted deal for Bonanza aircraft, but the research was applied toward concealed antennas for experimental aircraft. According to many messages in the archives, the Sportcraft wingtip VOR antenna is a very workable alternative to mounting a conventional VOR antenna on the exterior of the aircraft. I am not an electrical engineer or expert by any means, but as I understand the situation, it is not possible to just cobble together a simple whip antenna as is possible for the comm radio. This is because the nav radio expects to see a balanced load at the end of the coax, not an unbalanced whip. The Sportcraft unit utilizes a "gamma match" that somehow tricks the electrons into thinking that the weird looking combination of sheet aluminum is actually a fancy "for real" VOR antenna. Here is the area of the antenna where the coax attaches. 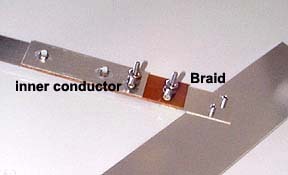 The inner conductor goes to an element adjacent to a bakelite insulator that overlaps but isolates electrically the element from the remainder of the unit. The coax braid is grounded to the antenna which is in turn grounded to the airframe....and somehow it works! The antenna is constructed of 0.016" 6061 aluminum sheet stock and the weight of the entire unit is negligible. It is designed to be installed within the interior of a non-conductive wingtip, and this particular model is sized just right for the standard Vans wingtips. You can install the unit within either tip, but do not hook two antennae together since this creates electrical havoc with the nav radio. You are looking at the left wingtip of 399SB lying upside-down on the left wing. 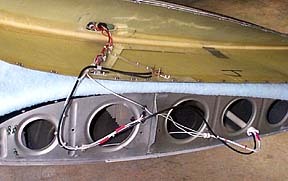 The antenna has been attached to the upper surface of the wingtip using the three supplied stainless flush head screws. The aft tip of the antenna is simply taped to the wingtip so it won't be flopping around. Bob is adamant about the nav and strobe lighting being routed as shown along the leading edge of the antenna; taking a short cut across the antenna will greatly reduce the efficiency of the unit. Nylon cable clamps are supplied that are attached with the afore-mentioned screws and I added another one to secure the coax so it would exit the antenna in the proper direction. 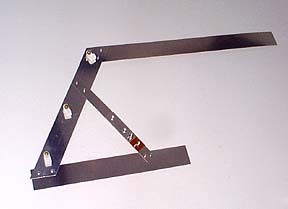 The instructions state to mount the antenna so the "ground" element will be trapped between the wingtip and the wing skin, but this is impossible with the construction of the RV wing. I drilled out the rivets holding four of the platenuts, and reinstalled them with the antenna element trapped between the nut and the wingtip. 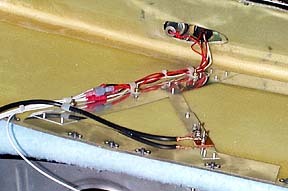 Once the wingtip screws are reinstalled, the antenna is grounded to the airframe. So, how does it work? On the initial test flight, I departed DCU and as I climbed through 2500' AGL, I dialed in the Shelbyville, TN VOR which was 60nm to the north. To my amazement the KX-125 immediately locked onto the VOR signal and removed the "flag" even though I was headed west which meant the antenna was on the "far" side of the plane! I initiated a standard rate 360 degree turn, and the signal only dropped out for a few degrees of the turn; I suspect that if I had been a couple thousand feet higher, there would have been no loss of signal since there was some hilly terrain between my position and the VOR. On subsequent flights I shot several VOR and localizer approaches and the antenna performed flawlessly. Contrary to what you might think, the signal does not drop out even when the airframe is between the VOR and the antenna. There may well be occasions when the signal will be dropped due to terrain or other unusual circumstances, but I have been totally satisfied with the Sportcraft antenna in the course of typical navigation and approach use. The fact that this high level of performance is achieved without having antenna elements in the slipstream is an added bonus.